What Day Of The Week Is December 9? 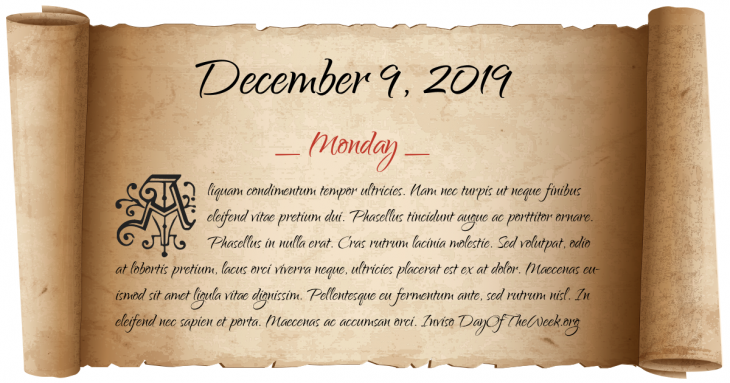 December 9, 2019 is the 343rd day of the year 2019 in the Gregorian calendar. There are 22 days remaining until the end of the year. The day of the week is Monday. New York City’s first daily newspaper, the American Minerva, is established by Noah Webster. World War II: The 19th Bombardment Group attacks Japanese ships off the coast of Vigan, Luzon. World War II: The Republic of China, Cuba, Guatemala, the Republic of Korea, and the Philippine Commonwealth, declare war on Germany and Japan. The Governor of Illinois, Rod Blagojevich, is arrested by federal officials for a number of crimes including attempting to sell the United States Senate seat being vacated by President-elect Barack Obama’s election to the Presidency. Who were born on December 9?